It’s almost swimsuit season ladies and we’re sure you’re thinking, “what’s the perfect swimsuit for me to wear this summer?” Thankfully your swimsuit shopping woes will not be an issue this summer. Lands’ End and Glamour is teaming up to bring the ultimate swimsuit experience to New York. On May 21st, anyone who stops by Land’s End The Getaway Tour at Flatiron Plaza, will get style tips to find the perfect swimsuit style for their shape, and the chance to shop for their perfect swimsuit, thanks to a complimentary professional swimsuit fitting and style session with Kendall Farr, fashion stylist, top-selling author and Glambassador from Glamour. What’s more, the first 100 attendees will receive a VIP gift bag complete with summer essentials and a great summer read from Random House. While enjoying the day’s event, be sure to check out the unveiling of Lands’ End traveling beach house – a beautiful Coastal-style beach house complete with sand dunes and an upper sun deck – you may find yourself resistant to leave. So if you’re free on May 21, 2014 from 11:00 a.m. – 5:00 p.m, stop by the Flatiron Plaza located at 23rd St and 5th Ave. Keep up with and share your own photos of the Lands’ End The Getaway Tour with hashtag #GetawayTour. What can submitting your GlamLouder and Hpnotiq‘s Bling it On glam look get you? Hpnotiq wants to see how you pull it all together for a chance to win the ultimate accessory: the handbag of your choice valued at up to $1000! Yes dear readers, for this round they’re choosing 4 lucky winners to spend up to $1,000 on the fabbest bag you can find to compliment your glammest look! Wouldn’t you love to win that? If you’re lucky to be one of the 4 winners, you’ll also be able to compete in the final round for a chance to win the grand prize trip for you and three friends to go shopping with a celebrity stylist in Los Angeles! What makes this contest even better – the grand prize winner will star in a professional photo shoot for the chance to be in a real Hpnotiq Ad! Fun, right? and if you’re familiar with the delicious blend of French vodka, exotic fruit juices and cognac that make up Hpnotiq, you will definitely want to be a part of their upcoming campaign – I know I have enjoyed drinking it for years and being a part of this would be amazing. And of course since fashion is embedded into our DNA, winning a gorgeous bag and shopping spree is a dream prize. To enter visit http://9nl.it/irby/, or visit Hpnotiq’s Facebook page, follow @Hpnotiq on twitter and tweet them your picture using the hashtag #GLAMLOUDER. For the full set of rules on the contest, click here – http://www.hpnotiq.com/uploads/glamlouder_rules/. I will surely be stalking Twitter to see everyone’s glam photos. Hello, to my wonderful fellow Bob Mackie, and Barbie fans and collectors – there’s an exciting online event happening and not only can you be a part of it, you could possibly win. 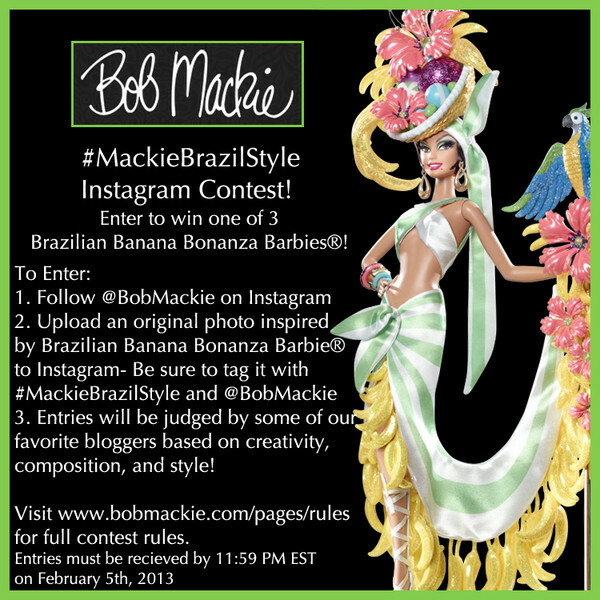 Bob Mackie Design Group has launched their first Instagram contest where they will be giving away three of the new Bob Mackie Brazilian Banana Bonanza Barbies. Yes, a mega giveaway where the prize is a two-for-one iconic-branded gift. To enter, fans must follow @BobMackie on Instagram – www.instagram.com/bobmackie, upload a photo inspired by the new Bob Mackie Barbie (pictured above) and tag it with #MackieBrazilStyle and @BobMackie. The photo can be anything you want – an outfit, a pin board, shoes, a fiercely decorated hat like the one Brazilian banana Bonanza Barbie is wearing, artwork, sketch, a landscape image, etc. The photo must be your original contribution. You can see the full rules at www.bobmackie.com/pages/rules. For more information on this contest can be found here: Enter the #MackieBrazilStyle Instagram Contest! I recently featured some enchanting pieces from the Sabido & Basteris jewelry collection as a Valentine’s Day gift idea, see it here – Valentine’s Day – Say I Love You With Sabido & Basteris. To remind you a bit about Sabido & Basteris, this world-class jewelry maker uses technology to convert fine silver, 99.9% pure, into colored silver threads for ultra soft precious metal fabric which results in exquisite pieces of jewelry. 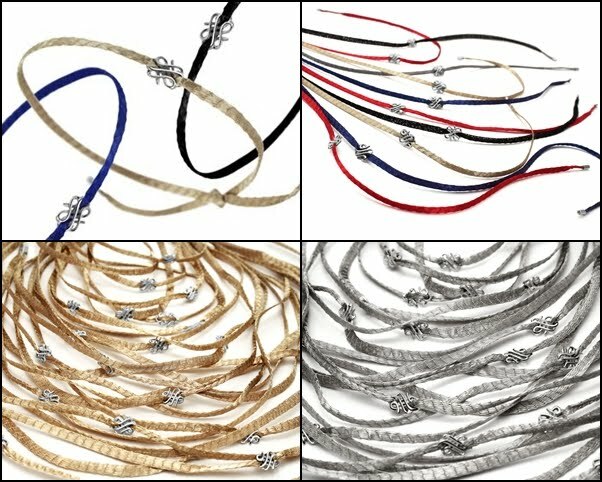 I’m happy to gift FIVE (5) lucky readers with a super sweet and delicate Wish Bracelet (featured in various colors below). The beauty of the Wish Bracelet is you make a wish as you knot the ends. When the Wish bracelet breaks, it releases your wish. Sabido & Basteris Wish bracelets are simple enough to wear everyday, yet elegant enough for any occasion. 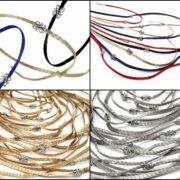 You can wear it as a single strand or wear multiple wish bracelets for a layered look. The sparkling silver color won’t fade in the sun or in the shower. The Wish Bracelets are available in several colors and almost any other color is available by special order. Some of the colors this delicate gift comes in are gold, silver, black, white, pink, baby blue, turquoise, cafe, etc. NO PURCHASE NECESSARY. Void where prohibited. Must be legal U.S. and Canada resident, 18 yrs or older to enter. Sweepstakes to commence on February 18th, 2012 at 7:00 p.m. Eastern Time (“ET”) and end on February 25th, 2012 at 11:59:59 p.m. ET. My Life on and off the Guest List will determine (5) five winners by random drawing from all eligible entries. Five (5) winners will each receive (1) Sabido & Basteris Wish Bracelet. Limit one prize per household. Odds of winning are dependent on the total number of eligible entries. Approx estimated retail value of prize is $65.00 each. Winner will be notified by email. Offer valid while supplies last. Giveaway sponsored by My Life on and off the Guest List; Prize provided by Sabido & Basteris. 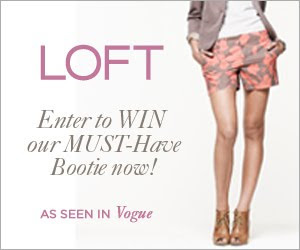 Attention Shoe Addicts – Enter to win LOFT’s MUST-HAVE BOOTIE!! And I must have it (so you know I’ve already entered). LOFT’s has announced a fabulous Spring Sweeps (ignore what’s going on outside). One of us (hope its me) will win a pair of LOFT’s MUST-HAVE BOOTIE, a stylish peep-toe. Recently seen in the pages of Vogue magazine, this flirty, lace-up pair combines the sturdy coolness of a chunky heel with the feminine allure of a peep-toe. So whether your life demands pencil skirts or denim leggings (or both), this Bootie is a shoe-in to become your chicest, most versatile mainstay. Visit LOFT’s Facebook Fan Page to enter and to receive more information but hurry—the contest ends Sunday, February 6th!!! https://mylifeonandofftheguestlist.com/wp-content/uploads/2011/02/LOFT-Sweeps.jpg 250 300 Glasgow Skinner https://mylifeonandofftheguestlist.com/wp-content/uploads/2013/04/on-an-off-1030x151.png Glasgow Skinner2011-02-02 18:39:002015-10-03 16:11:27Attention Shoe Addicts - Enter to win LOFT's MUST-HAVE BOOTIE!! It’s time again for another fantastic giveaway. I’m really excited to do this giveaway as I’ve been using the Luminess Air Airbrush System ( the #1 selling do-it-yourself airbrush makeup kit) for a while and I am completely in love with it. My makeup feels so light and looks incredibly natural, so much so that I do really forget that I am wearing makeup. The best part is that it covers all my imperfections without having to layer like I’m putting down concrete. 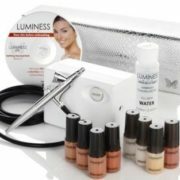 Unlike many airbrush makeup companies out there, Luminess Air is water-based makeup. You may remember I was first acquainted with Luminess Air at the HauteLook Lounge during Fashion Week and then got reacquainted with them again at the recent Makeup Show NYC where I got to meet their wonderful makeup wizard, Marc Harvey who created a flawless full face look on me. So get ready ladies, one of you will be my winner. NO PURCHASE NECESSARY. Void where prohibited. Must be legal U.S. resident, 18 years or older to enter. Sweepstakes to commence on Thursday, June 5th at 12:00:00 a.m. Eastern Time (“ET”) and end on June 12th at 11:59:59 p.m. ET. My Life on and off the Guest List will determine (1) one Winner by a random drawing from all eligible entries to receive (1) one Luminess Air Airbrush Makeup System. Limit one prize per household. Odds of winning are dependent on the total number of eligible entries. Approx retail value of prize $269. Winner will be notified by email. Offer valid while supplies last. 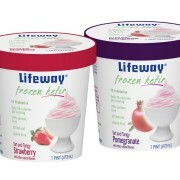 Giveaway sponsored by My Life on and off the Guest List; Prize provided by Luminess Air.